The wardrobe door swung open and a mirror glinted into view. I was relieved. On first entering the hotel room it looked like there was nothing to do my make up in. That grey haired guy was there too, his hair was getting longer and more wrinkles were appearing on his face. He would be gone soon and like a butterfly appearing out of a chrysalis I would unfold out and I would be transformed. It takes a couple of hours for me to get changed. On the face of it I don’t have a lot to do but perfection does takes time. I removed my sparkly dress from its bag and hung it up. Sometimes a dress has an attraction that you can’t quite quantify and this dress has it for me. I stand and admire it for a minute on its hanger. I tipped all the make up onto the dressing table and picked out the moisturizer. Mrs Sox entered the room with hair dryer in hand. The hotel had not put one in the room and she had nipped down to reception to get one. ‘Starting to make the room look like home’ she said with a slightly sarcastic tone. I do tend to hog the mirrors and any flat surface when I am getting ready. Mrs Sox was now ready and we had just got a message to say our taxi was now outside and waiting for us. Mrs Sox taps on his window as I am stood next to her the driver opens his window by half an inch. I had asked the reception to call me a taxi and they had put the taxi in my male name. The driver was expecting a guy. Confusingly for him I turned up in short dress and heels. I felt quite flattered that he thought I was a girl until I opened my mouth. The trip to the bar across from the night club was short and there were girls outside as we turned up. With temperatures starting to get near freezing you have to be somewhat hardy to smoke in this country. These girls were doing the keep warm jig whilst blowing smoke into the air. The bar was full of girls and admirers. It took quite a while to get served. We slid our way through the throng to get away from the bar and noticed Maddy and Jemma sat at a table, so we joined them for a chat. Shortly after we decided that an early entry into the club (Pink Punters) was in order. The club is very well run and has helpful staff. A large fire welcomes you as you enter the club and is much appreciated on a cold evening. We were soon joined by Natalie and a little later we caught up with Gina and Emma. The night soon slipped away and Mrs Sox began to feel tired we said our goodbyes and headed back for the hotel room. In the morning I kept the mirror at a distance and tried not to look at that old guy. I wish I had the confidence (and friends) to go out fully dressed. I usually make it my new years resolution but it never comes to fruition. So sorry to have missed this event this year, Bobby. Despite you wearing the same dress twice, it would’ve been great to see you and Mrs Sox. 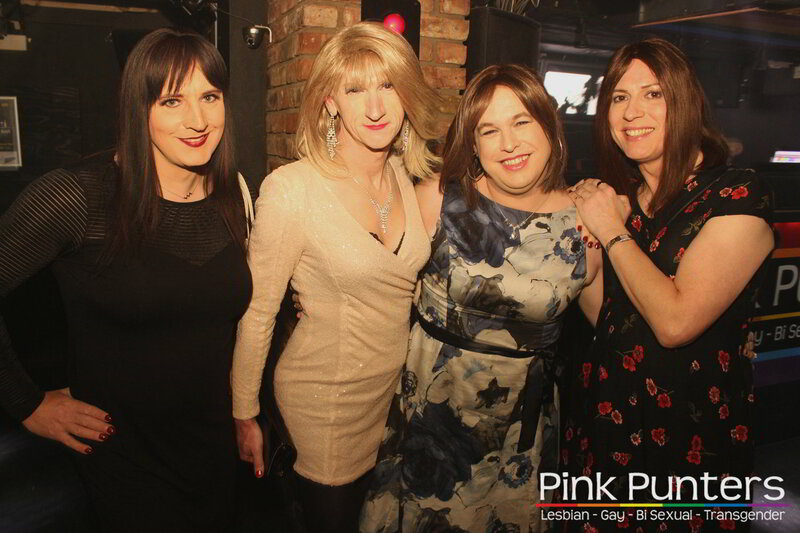 And Becky (commenter above) and any other girls wanting to get out, Pink Punters is where I first went out as a girl – it’s the perfect place to do it. But I know how much courage it takes. You have to overcome your own fears. Great looking all of you. Can’t wait for me to get some stuff rebuilt and get out myself again. But I have missed it.